The forest comes upon us suddenly. One moment we are in a backyard and the next we're in the woods, like stepping through the looking glass. Even on a cloudy day like today, the quality of light is different -- filtered -- and the moss, which is everywhere, seems to absorb and muffle sound. The ground is springy with moss, and a silky patchwork clothes the Doug firs that loom above us. The well-worn trail cuts through a carpet of moss and false Solomon's seal. Mizu is taking me to a patch of wild ginger she's been visiting since she was a kid. We are accompanied by two of her three daughters. Helen, who is 4 and the middle child, stomps ahead, brandishing a stick. Mizu and I follow behind with Lucy, who seems remarkably sanguine about the steep hill. Seeing the little girls in the woods brings back memories. Like me, Mizu spent a long stint in the city but eventually chose to return home to the Oregon Coast Range. It's good to be neighbors again. When we were children, Mizu, her brother Japhy and I used to play together on this same land -- Mizu the ringleader and Japhy the daredevil forever nudging at my timid nature. With them, I climbed higher, jumped to the farthest slippery creek rock, and vowed I'd learn to skip a stone more than 20 bounces. The same spark of adventure still flickers in Helen's wolf-blue eyes. "Ah here it is," Mizu says, crouching. "Do you see it?" she asks her girls. I look too, my eyes lighting on an exotic looking grass that pokes from the leafy carpet. Clearly wild ginger, I think to myself. I'm wrong, of course. Helen points out the wild ginger, hidden here and there amid the false Solomon's seal, its heart-shaped leaves a perfect camouflage. Mizu picks a leaf, crushes it and hands it to me. The smell is intensely pleasant -- gingery, yes, but sweeter and milder, like good incense. "It's one of my favorite plants," Mizu says. When I got interested in foraging, my friend Tom sent me a box of books on plants. I've enjoyed the reading, particularly when it pertains to lore and history, but I've found that identifying wild edibles by the book can be a tedious process. Learning is easy, but knowing is a different story. Foraging with Mizu is saving me from tedious cross-referencing. After all my time alone in the woods, it's refreshing to make an expedition in knowledgeable company: Unlike me, Mizu is a science person. Wild ginger, or Asarum caudatum, is an edible native plant, though it's not actually a ginger, Mizu tells me. It's called ginger because it smells like ginger. I trace the scalloped leaf edge with my finger, while Mizu pokes around until she finds a flower, which is the color of wine and looks exotic somehow. We each dig up a few roots, leaving most of the patch intact. The plant doesn't grow too fast, and Mizu says that though the family often walks this path, she only harvests ginger for tea once every year or two. Mizu is passing her knowledge and curiosity on to her girls -- Helen crouches to inspect a beetle, raspberry red against electric green sorrel, and she points out plants along the way: Smith's fairy bells, false lily-of-the-valley, bleeding hearts. "Have you ever smelled bleeding hearts?" Mizu asks. I haven't, and this surprises me -- I've been gathering the flowers since childhood. I bend down to smell a cluster, which is redolent of cinnamon. Thanks to Mizu, I now know that bleeding hearts smell as pretty as they look. I've spent hour upon hour alone in the woods this past year, and having company on a foraging expedition is a novelty. I feel stupidly moved by the ways a friend or stranger can enrich our lives: In company, we have the opportunity to see (or in this case smell) aspects of the world we might have missed. When we return to her house, Mizu brews a pot of tea with the wild ginger root, and I linger longer than I intended. Mizu uses a small root, but the aroma of the tea is surprisingly intense: For a native plant, the wild ginger smells luxurious and exotic, like a place I would have imagined as a child -- a land of brocade tents and magic carpets. Back home again, I hit the books. Now that I've gotten the pesky identification process out of the way, I'm left to the entertaining part of my research. "Plants of the Pacific Northwest Coast" tells me that all of the local tribes used wild ginger in one way or another: The plant was applied as a poultice for headaches, intestinal pains and knee pain, and it is known to have antibiotic properties. To treat arthritis, the Sechelt added the boiled leaves to bath water. To treat tuberculosis, the Squamish and the Skagit ingested the leaves. The Stl'atl'imx also bathed in the leaves, but in this case for good luck and protection. The Skokomish and the Nuxalx drank wild ginger-root tea to settle the stomach. "Plants of the Pacific Northwest Coast" says the plant is edible, but when I look online, in addition to a handful of recipes and recommendations, I find a few references to wild ginger's potential to both cure and/or cause cancer. Evidently it may contain traces of aristolochic acid, which was once believed to reduce tumors but is now considered carcinogenic. (It's worth noting that study results pertain to Asarum canadense, not Asarum caudatum). Yet another example of the potentially paralyzing effect of having a world of information at our fingertips. Once upon a time, a book and a friend's tradition would have been enough, but now I have to go digging around on the Web to discover information I didn't want to know. So do I follow a thousand years of native tradition or do I heed the Internet? I guess a more cautious soul would change tonight's dinner plans, but when I think of all the bad habits I've nursed over the years and the reputed cancer-causing properties of common household items (antiperspirant, cell phones, sugarless chewing gum), I kind of doubt it's going to be a teaspoon of wild ginger that gets me in the end. As usual, my curiosity takes the upper hand. 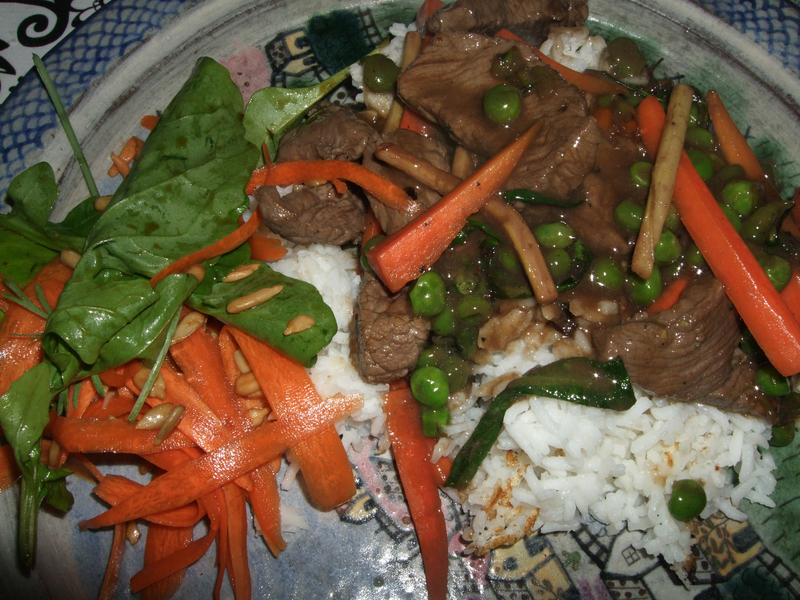 The menu: stir-fried elk with wild greens and wild ginger, served over rice and accompanied by a salad of our garden's first greens. I choose short yet stout salmonberry and thimbleberry shoots from my front yard. The shoots snap off easily at the base of the plant, and the newborn thorns and leaves peel away with minimal effort. I've never cooked with either variety of shoot, but they're mild raw, so I'm hoping they'll add body and crunch to my stir-fry without drowning out the flavor of wild ginger. Inspired by Fat of the Land, I also pick a handful of cat's-ear. Carrots and peas will add a little color to the dish, and half a serrano chile will provide kick. I'm worried that the flavor of the wild ginger won't come through, so I practice unusual restraint with the chile, garlic, onion chives and scallions. The finished dinner is arguably the best meal I've ever made using wild ingredients, though I have to share some credit with my husband, Rich, who grew the lettuce and spinach for the salad. It's awesome to be eating from our garden again: The salad is light and crisp in the manner particular to just-picked greens. As for the stir-fry, it exceeds my expectations. I needn't have worried about obscuring the ginger. The flavor saturates, spicy and sweet with shades of amber. The wild ginger tastes better than actual ginger -- it's lighter and far more complex. Perhaps due to my unusual restraint with the garlic and scallions, the individual flavor of each ingredient is still evident: The thimbleberry and salmonberry shoots have a spring fresh crunch, and the cat's-ear is silky and rich. Carrots and peas provide robust contrast. Using five wild ingredients (wild ginger, elk, thimbleberry shoots, salmonberry shoots and cat's-ear) and five garden ingredients (lettuce, spinach, shallots, onion chives and garlic) cuts down on the cost. Including the salad dressing and rice, the meal costs approximately $2, or $1 per person. Of course there are evident risks and hidden costs -- the life of the elk, the time and money our friend invested in hunting the elk, the days Rich worked in the garden, the hours I spent hiking with Mizu and the girls, and the time I spent researching and cooking. I try to chew slowly as I think about the work and life that went into this meal. This is the last of our elk, and I may never eat wild ginger again, which gives my last forkful a certain poignancy. Heat wok over high heat. When wok is hot, add 3 tablespoons of coconut oil. When oil is hot, turn down to medium and add salt, wild ginger and garlic. Stir-fry for a moment. Remove all Group 1 ingredients from wok, including oil. Set aside. Reheat wok to medium high. Add 1 tablespoon of coconut oil. When oil is hot, add ingredients from Group II. Add ingredients from Group III and cook for another minute. Turn heat down to medium. Add ingredients from Group IV and stir until a gravy forms. Serve over rice.